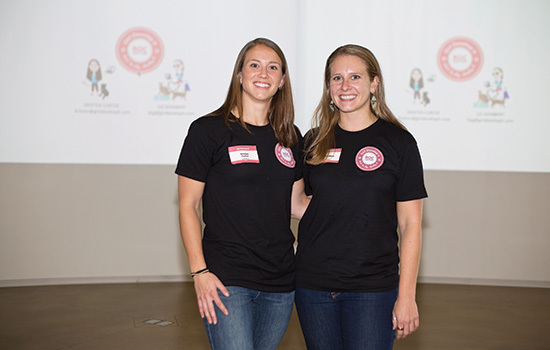 Kristen Curtze ’09, ’11, left, and Liz Gombert ’09 launched a chapter of Girl Develop It in Rochester in September. Kristen Curtze ’09, ’11 (new media interactive development, communication and media technologies) initially didn’t think too much about the pink sticker a fellow female developer gave her at a conference in South Carolina this summer. But after the woman explained to Curtze and college friend Liz Gombert ’09 (new media design and imaging) that the sticker represented the organization Girl Develop It, they realized that Rochester could benefit from having a chapter. Rochester’s Girl Develop It kicked off with a launch party in late September in RIT’s Center for Media, Arts, Games, Interaction and Creativity (MAGIC). Both MAGIC and RIT’s Women in Computing are supporting the organization. The goal of the group is to help adults learn Web and software development through classes, workshops and networking. Although the organization is targeted at women who are underrepresented in the Internet technology field, men are welcome. Curtze and Gombert hope to start introductory to basic coding and Web design classes by the end of this year. Classes could be all in one day or split up into several nights, depending on the teacher. Eventually they will add more advanced classes and networking events. Curtze, a Web developer who has never worked with another female in IT, said they are already hearing positive feedback from local start-ups, who think this will help the Rochester workforce get more well-rounded. Gombert added that they realize change isn’t going to happen overnight, but this organization is a good start. To learn more about Rochester’s Girl Develop It, go to www.meetup.com/Girl-Develop-It-Rochester. To learn more about chapters in other cities, go to www.girldevelopit.com.